The gist of the teachings of the prophets of God is that man after negating the fictional sight, should equip himself with that sight which witnesses the reality. Entering into one after leaving the other or getting something after quitting the other is only possible when we can disunite ourselves from that which is to be quitted. This act of disuniting ourselves, in terms of spirituality, is called negation. And when a person manages to negate himself, the world of realty is witnessed by him. Muraqabah is the first lesson of self-negation. Performance of Muraqabah is such an act which has no logical explanation except that there are two types of sight functioning simultaneously in man. One is limited and cannot see without a medium and the other one is unlimited and needs no medium to behold. How to do we See? Space having dimensions is the medium. The material eye cannot see beyond the limits of space and if space is removed it will not be able to see any thing. This can be proved by performing a simple experiment Just focus your eyes on a point steadfastly so that there should be no movement in the eyelids and the eyeballs. When the eyes will cease to move there would remain nothing before the eyes save light and empty space. Law:- In fictional senses the operation of sight takes place when the eyeballs move and eyelids are blinked. If the eyelids of a person are stopped from moving, within few seconds, he will not be able to see anything except darkness. The act of blinking of eyelids slightly strokes the eyeballs which helps in transferring the images of the external objects to the screen of our mind. Process of Vision in Muraqabah? When someone sits for Muraqabah and closes his eyes, the movement of eyeballs and eyelids remains in action. Although the blinking temporarily stops when the eyes are closed, the movement of eyeballs does not stop and with the movement of the eyeballs the eyelids also keep on moving which replaces the movement of the blinking, that is, the transfer of images keeps on taking place on the screen of the mind. The person doing Muraqabah focuses his mind on one single point. The point in this case is usually the concept of his spiritual mentor, that is, he focuses all his witnessing abilities with concentration in thinking about his spiritual teacher, in order to get the image of his mentor on the mental screen, as long as he remains in the state of Muraqabah. Law:- The properties, characteristics and potentialities related to an image also transfer on the screen of the mind when the image is formed on the mental screen and the mind perceives them accordingly. For instance, a person is looking at fire. When the image of fire transfers on the mental screen the warmth and heat of the fire is perceived by the mind. A person who is present in a garden enjoys the freshness and coolness of trees and plants present in the garden to create their image on his mental screen. Similarly when image of the spiritual mentor transfers on the screen of mind, the Presented Knowledge which is operative in the spiritual teacher, also transfers with it and the mind of the student gradually assimilates the same. ‘Be!’ What is to ‘be’? The program present in the mind of the One who uttered ‘Be’ should come into being, spiritually. When the program took the shape and form of incorporeal manifestations, The One who commanded ‘Be’, appeared before the spiritually displayed world so that the ignorance could change into knowledge and awareness. We know, the sight gets activated when a focal point to concentrate is available to it. In that stage of creation, the focal point was the Creator and the Divine Planner. After coming to this world the focal point undergoes a change but the law remains the same. Just as the reality is transpired upon the mental screen, the hypothetical and temporary senses are also carried to the screen of the mind. It is only that the constraints of short lived and temporary states of mind keep us incarcerated in the limiting senses. Muraqabah, thinking about the spiritual mentor, an attempt to concentrate and focus our thoughts on someone, so that his image could recurrently reflect upon the screen of our mind, we are liberated from the limiting senses. The more frequently a thought is displayed upon the mental screen, the more vivid would be the formation of a pattern in the mind. And, this pattern of mind, in terms of spirituality, is called the ‘thinking approach‘. 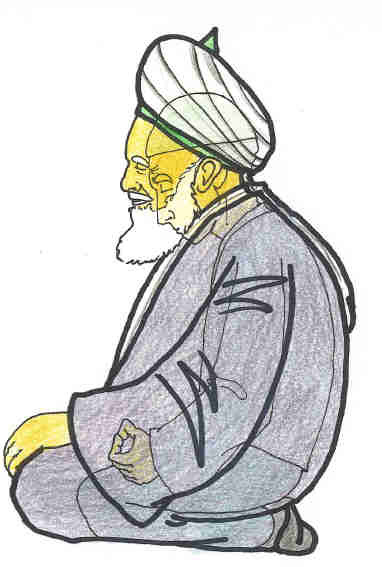 When we imagine the spiritual mentor or ‘Shaykh’, as a matter of eternal law, the knowledge of Elohistic Attributes operative in the mentor or Shaykh is reflected upon our mind with frequent repetitions resulting in enlightenment of the mind of the spiritual associate with the lights functional in the mentor and transferred to him. The enlightenment of the mind of the spiritual associate finally reaches the level of his mentor. This state, in Sufism, is called ‘Affinity’ (nisbat). The best and tested way to enjoy the affinity, according to spirituality, is the longing passion of love. 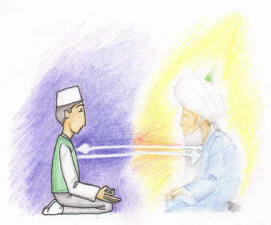 The mind of the mentor keeps on transferring to the spiritual associate according to the passion of love and longing for the mentor flows in him and there comes a time when the lights operative in Shaykh which actually are the reflections of Beatific Visions of God are transferred to the spiritual associate. In the state of spiritual associate’s oneness with the mentor those abilities of the Shaykh become activated in the spiritual associate (salik) because of which the Shaykh enjoys the affinity of the Holy Prophet (PBUH). This stage, in terms of Sufism, is called ‘Oneness with the Holy Prophet’ (Fana fir Rasool). It is the holy statement of the Holy Prophet (PBUH), “I am a human being just like you but I receive revelation’. 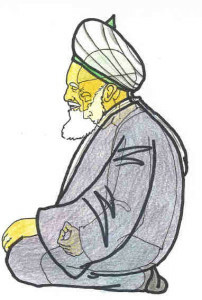 When this statement is closely examined, it is found that the exaltation of the Last Prophet is that he received Revelations from God, Almighty which reflects the Divine Knowledge (Ilm-e-ladduni); the knowledge directly inspired by God, the Beatific Visions of God and the refulgent Lights upon the blessed Mind of Holy Prophet. In the state of ‘Oneness with the Holy Prophet’ a spiritual associate because of his passion, longing and love gradually, step by step, assimilates and cognizes the knowledge of the Holy Prophet. Then comes that auspicious moment when the knowledge and learning is transferred to him according to his capacity from the Holy Prophet (PBUH). The spiritual associate absorbs in the traits of the Holy Prophet (PBUH) according to his aptitude, ability and capacity and because of his affinity with the Holy Prophet and his support he manages to reach that state when he had acknowledged the Lordship of God, the Lord of the worlds saying, ‘Yes, indeed you are our Lord God!. This affinity, in sufism, is called ‘Oneness with Allah’ (Fana fil-lah) [Annihilation in Allah] or simply ‘oneness’ (wahdat). After that, if one is bestowed with ability one explores those areas about which narration has no words to explain them because of their delicacy and subtleness. The purpose of narrating all this is that there is a screen in the human mind upon which images are transferring ceaselessly. It is yet another thing that meaningfulness and purpose of these images are interpreted differently by different people. If the mind of the Holy Prophet interpretation of these images is taking place in the sphere of the Acquired Knowledge then the information of these images will be considered fictional and hypothetical. And, if the images are transferring in the sphere of the Presented Knowledge then the knowledge contained in the images is real and pertains to reality. But the law remains the same that man’s sight and comprehension cannot do anything if the images are not transferred on the mental screen of the human beings.